Jenny, Stacey, and Stasia all came over for another girls' night. Stasia and I talked about the menu and wanted something fresh and on the healthy side. So tonight's menu was fresh veggies with homemade yogurt dill dip, corn chowder, and paninis. 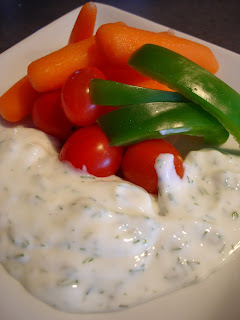 I love the yogurt dill dip because it has such fresh flavor. It was pretty low in fat as well. - finely chopped fresh dill weed; I used the dill from 2 stalks. Mix all of the ingredients together and adjust the salt if necessary. 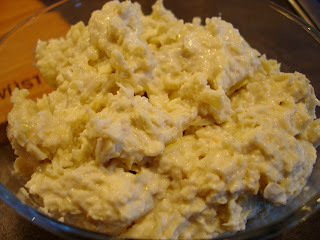 I love serving this dip fresh out of the fridge so it is good and cold. 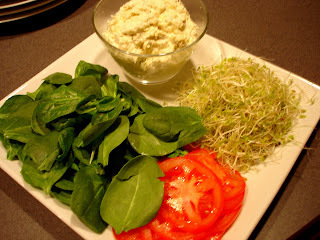 Add some crunchy veggies and you have a healthy and flavorful appetizer. A panini is simply a grilled sandwich, but ingredients that are used on paninis are usually a little different than what you would put on a cold sandwich. 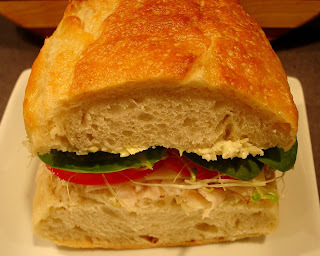 Also, the bread used is usually a thicker, heartier bread like an Italian loaf, French bread, foccaccia, or ciabatta. Mayonnaise or mustard aren't usually put on paninis - you'll usually see something like olive oil and balsamic, brie, pesto, or a spread to take the place of the traditional condiments. I made an artichoke spread for our paninis. Heat olive oil in a small pan; add garlic, saute til slightly golden, and transfer to a mixing bowl. Add the rest of the ingredients to the bowl and stir. Adjust the salt if necessary. My spread was just a touch too chunky so I gave it a few pulses with my handheld immersion blender - voila! It was perfect and got nice and melty when we grilled the paninis. - Loaf of Italian bread and a loaf of ciabatta bread; Stasia gave me the tip of slicing the bread into wide slices so the grill would hit the top and bottom of the bread, not the sides. This worked perfectly. Other ingredients I'd use next time include balsamic vinegar, pesto, roasted red peppers, brie, bacon, and different cheeses. 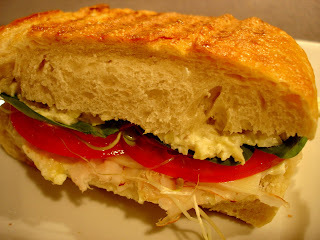 Finally, what goes better with a panini on a cold night than a bowl of chowder? I made my corn chowder - the recipe can be found here. Thanks for such a fun night Stacey, Jenny, and Stasia! Let's do it again soon.